Korean handset maker Samsung launched its most expensive device in the country, Galaxy Note 4, pricing it at about Rs 58,300. New Delhi: Korean handset maker Samsung launched its most expensive device in the country, Galaxy Note 4, pricing it at about Rs 58,300 as it looks to defend its turf in the multi-billion dollar smart devices market in India, as per a PTI report. Samsung had unveiled the Galaxy Note 4 last month in Berlin at the IFA Electronics show. 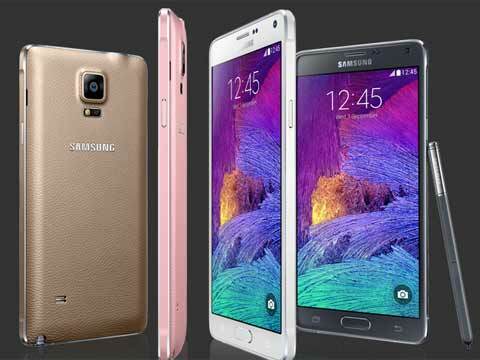 At the launch price, the Samsung Galaxy Note 4 is currently its most expensive device. The previous generation Note 3 (N900) is retailing at about Rs 38,900 onwards, while its flagship Galaxy 5S is selling for about Rs 36,000. "The Galaxy Note 4 is an example of Samsung's commitment to deliver iconic and differentiated products. The Note 4 is an innovation with the combination of an enhanced S Pen, large and vivid display and superior productivity features to provide the most refined Galaxy experience to our customers," Samsung India VP (Mobile and IT) Asim Warsi told reporters here. The phablet is hitting the market just ahead of Diwali and will face stiff competition from Apple's new devices -- iPhone 6 and iPhone 6 Plus, which will be available from October 17. The Galaxy Note 4 features a 5.7-inch quad HD Super AMOLED display, 3GB RAM and 32GB internal memory (expandable further). It has a 16MP rear camera and 3.7MP front camera. The Note 4 comes with an enhanced S Pen to serve as the primary interface for routine tasks. It offers a much more authentic pen-like experience. It also features a fast-charging technology to charge the battery from 0 per cent to 50 per cent in 30 minutes. Samsung has been facing strong competition from homegrown players like Micromax and Karbonn. Though it continues to be the leader in the Indian smartphone market, Samsung has seen its share coming down from 35 per cent in January-March 2014 quarter to 29 per cent in April-June quarter, according to research firm IDC. Micromax, on the other hand, has grown its share from 15 per cent in Q1 to 18 per cent in the following quarter. India is one of the fastest growing smartphone markets globally, with 18.42 million smartphones shipped in Q2 alone. Samsung has also its Samsung Gear S smartwatch, priced at Rs 28,900, which features 512 MB RAM and 4 GB internal memory. It has also unveiled the Gear Circle, a neckband to help control calls/music for about Rs 8,500.